The Original: Floatron Floating Solar Pool Water Purifier Typically 80% Chlorine Reduction! Completely safe for kids and pets! Highest quality made in the USA! View differences between the original floatron and latecomer versions. A revolutionary concept, the Floatron combines the eco-conscious value of solar power with the scientific breakthrough of pool water Ionization. The Ionization process used by the Floatron naturally, economically, effectively, and safely controls all the harmful micro-organism growth in your pool... reducing toxic Chlorine and oxidizer use! Reduces up to 80% of all the costly chemicals needed to kill unsafe algae and bacteria in your pool water - that also can cause serious damage to the earth's delicate ecosystem. The Energy SuperMarket's most technologically ingenious product, the inventive design of the Floatron intuitively combines two eco-friendly resources, plus offers such great potential benefit for use in protecting the environment and human health it has earned a Five star plus rating in our Consumer Value guide! that comes with a naturally pure, chemically-free swimming pool! electric power with the safe natural ionization purification process. ultra pure ionizing electrode that suspends below the waterline. • naturally, and efficiently eliminates growth of micro-organisms. • during hot summer conditions, due to off-gassing evaporation. • greatly enhance the ionization purification process! • absolutely no possibility of an electric shock hazard. • controls; no moving parts assure long-lasting durability. • completely safe and non-toxic to adults and young children. • feel, smell, color, or cause cloudiness of the pool water. • fall within established EPA drinking water standards. • chemical concentrations associated with chlorine use. 1- The Floatron mineral electrode primarily consists of copper, silver, and zinc – an alloy which took us decades to fine tune; most of the knockoff products are of copper only or copper/zinc only; this accounts for inferior performance because the germicidal properties of silver are not present. 2- The overall size of the unit, including the solar panel output, is lacking for larger pools – meaning pools larger than above ground size. The cheaper price reflects a lesser manufacturing cost, primarily due to a lower output photovoltaic panel, which means that sort of product can be fitting for smaller pools only. 3- Materials wise, we know that none of the copy cats feature the same selection of materials as the floatron – especially where this is a critical issue when it comes to longevity. We expect to see malfunction in these copies after about a year or two in service. 4- Generally speaking, these units are lacking important components, such as the electrode basket. We are waiting to see how long it takes for them to realize that the basket is an important part of the system to ensure a clean pool. 5- Compare warranties... if there is a warranty. Our 24 month guarantee provides assurance which just cannot be found with the others. 6- Customer service; Floatron's is the best, while most of the others have none at all. The concept "you get what you pay for" is the reality when it comes to our product. Our intention is to maintain our #1 position by showing and telling the interested customer the many advantages offered by owning and using the floatron. • Floatron is powered by the Sun's FREE energy!!! • Number one choice worldwide with tens of thousands units sold! Floatron. The Floatron incorporates highest efficiency photovoltaic cells available. The bumper is constructed of space-age polymers which are weather, water, sunlight, and chemical resistant. 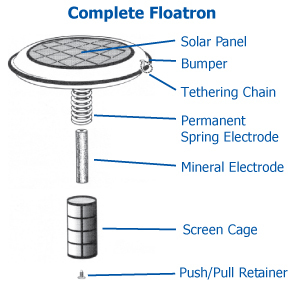 The permanent parts of the Floatron are the photovoltaic cells, bumper, and under-side spring electrode. Mineral Electrode (Part #F-104) and 2 Push/Pull Retainers. The mineral electrode is sacrificial and designed to slowly disintegrate. After an average of 12 - 24 months, depending on conditions, the electrode will wear away and require replacement. You will know this when it is "pencil thin", or about 1/4 inch at its thinnest point. The purpose of the screen cage is to trap any deposits or residues which form on the electrodes during normal operation. The screen prevents any particles from falling into the water or onto the pool bottom. The mineral electrode is made of a unique alloy of several specific metals, predominantly copper. The ion test kit detects the presence of the copper ion, thereby enabling you to determine if the water has an adequate level of protective minerals. The reagents in the kit are very sensitive, and readings can be affected by various interferences. accordingly, use the ion test as a basic and general indicator. Test only once a week; more often is unnecessary. The purpose of ion testing is to initially determine that it is safe to reduce chlorine, and subsequently to establish a floating schedule which results in a steady Ion reading of approximately .3 ppm. Depending on conditions, pools with 20,000 gallons or more usually require full time floating. Smaller pools will usually maintain an adequate Ion level with a part time floating schedule. For example, one day in, one day out, two days in, one day out, one week in, one week out, etc. Pools with screened enclosures will probably require full time floating as the output will be about half of that with normal full sun. Part #B-58 Floatron brushes are about the size of a toothbrush and are made with stainless steel bristles. Perfect for cleaning the Floatron electrodes. body oils, etc. which are not controlled by the ionization process. readily available at most pool supply stores. the pool water is fully ionized? a chlorine test kit] should be maintained to burn off contaminants. Q: Will other chemicals, such as algaecide, clarifier, stabilizer, etc. be necessary, or will shock treatment be required? A: Using the Floatron allows the PH level to stabilize. to be shocked. The floatron works perfectly with trace chlorine only. Q: Will chlorine or other oxidizers still need to be added daily? level of chlorine is to leave one tablet in the skimmer basket. Q: How does Floatron affect pool pump operation? optional at night, and the unit can be left in the pool overnight. Q: Does any unit ever required maintenance? and takes only minutes to change. Replacement cost is minimal. is excellent fertilizer on shrubs or lawn. *Complete start-up and operating instructions included. most pool stores are reluctant to offer them. The motive... profit. would dramatically reduce their high-profit chemical sales. Q: How does Floatron compare to other brands of ionizers? electronic controllers can add to their unreliability and cost. Compactness and portability are unique to floatron. Q: How does the Floatron actually purify pool water? ionized, they scatter throughout the water. more effective against algae than chlorine alone. evaporate, even under extreme, hot conditions. reason for larger chlorine doses in summer. Q: What is scientific basis for Ionization? A: Ionization is the taking apart of a material, atom by atom. accumulates trace minerals which help maintain its purity. Romans kept it fresh and free from algae and bacteria. energizes the electrodes creating the electrochemical reaction. Q: How important is eliminating Chlorine use? athletes would not have to swim in heavily chlorinated water. Q: But are the minerals generated from Floatron safe? Q: What is the service life of the Floatron? A: This product is designed to last about as long as your pool!!! Q: Does the Floatron stay in the water all the time? [e.g. few days in, few days out]. See instructions for full details. Swimming while the Floatron in the water is perfectly safe. in a pool. Customer chooses whether to tether it, or let it free-float. Q: What if the pool is covered? it is stationary, or free-floating. A: Yes! Just use a lower setting on the saltwater chlorine generator. Q: Will Floatron work in a "saltwater" pool? A: Yes! It works the same as when used in a "freshwater" pool. Q: Is the Floatron safe and effective for ponds and fish? circulation exists to mix the ions thorough the body of water. compatible with all well known varieties of fish. Q: Is the Floatron effective for pools/spas inside glass atriums? A: No, the Floatron doesn’t work through glass. cause serious problems in the environment, and in people! in the air, water, and food chain - and in our bodies, as well. development, immune system damage, and cancer. which were also initially thought to be harmless. *Floatron can be shipped to the locations listed below, for any other area please call for quote. Floatron Replacement Mineral Electrode and 2 Retainers. Free Shipping in Contiguous U.S.